Billboard correction: "To fight monsters, we created monsters"
• In the spirit of the Miss Rockaway Armada and Swimming Cities of Serenissima, Swoon and her band of DIY eco-art rafters are heading out on another excursion next month, accordint to crew photographer Tod Seelie--this time down the Willamette River in Portland. 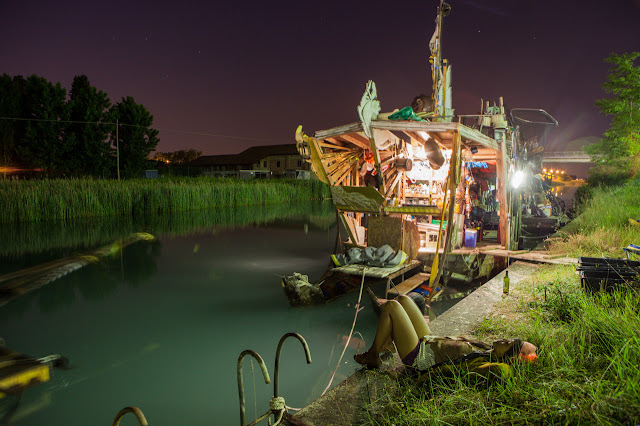 Wired looks at this "Burning Man Aquatic" through Seelie's photos documenting these "pirate utopias." • Regardless of how well art institutions or art markets are doing, most artists aren't the beneficiaries. Alexis Clements writes for Hyperallergic about five models for change, ranging from a renewal of artist labor unions to certification programs that ensure “ethical payment practices" (like the one W.A.G.E. proposes) to going off the grid altogether. • For his show at the Natural History Museum in London, Brazilian photographer Sebastião Salgado is showing works that depict the “stunning mosaic of nature in all its unspoilt grandeur." Surprising then is the show's sponsor: mining company Vale, which is accused of despoiling the Amazon and was dubbed company with the “most contempt for the environment and human rights” in the world by the Public Eye in 2012. • Impeach returns with more boxcar graffiti: this time an obituary for the middle class. • Your moment of stripes: Italian street artist Mimmo Rubino paints the rotating tank on a cement mixer. 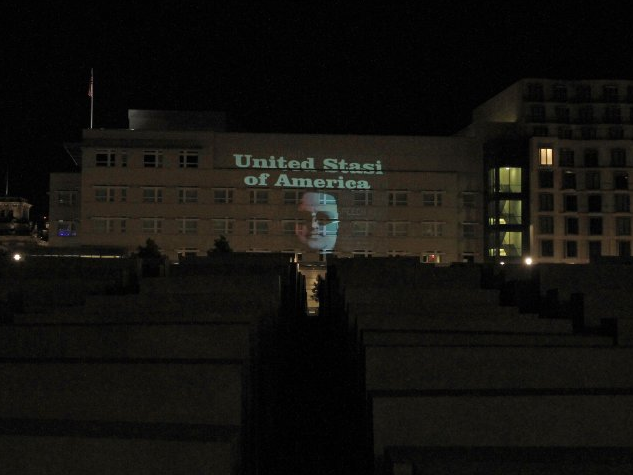 • Berlin police say they've opened an investigation following artist Oliver Bienkowski's protest over US spying Sunday night: he projected the phrase "United Stasi of America" on the exterior of the US embassy, which may violate a law against "insulting organs and representatives of foreign countries." The words were accompanied by the image of Kim Dotcom, the hacker icon and internet activist. • "I decided today that until the 'stand your ground' law is abolished in Florida, I will never perform there again," Stevie Wonder told concertgoers in Quebec Sunday night following the verdict in the Trayvon Martin case. "As a matter of fact, wherever I find that law exists, I will not perform in that state or in that part of the world." His boycott, writes Slate's Jack Hamilton, is "politically savvy, morally righteous, and it could be enormously important." A set of three posters dedicated to the teachers and staff of Jardin Magico that lost their positions due to pressure from the Department of Homeland Security. Their dedication to educate children in a bilingual environment was exemplary, inspiring, and loving. This action does not make our country safer, indeed, it threatens our immediate future. No human being is illegal. These posters are the voice of my family. We demand amnesty for all immigrants and an immediate end to this betrayal of the promise of America. • "Having suffered from military coups and oppressive regimes, our parents raised us to be as apolitical as possible," writes New York–based Turkish curator Ceren Erdem on the Walker Art Center homepage. "I am sorry — no, actually, pleased — to say that it didn’t work." She recounts her experiences at #occupygezi, from the cooperation of disparate activist groups--including anti-capitalist Muslims, LGBTQ people, and women--and creative resistance that took many forms, from the famed Standing Man to "earth fast-breaking," a communal feast in the streets to mark the first meal of Ramadan. • Eugenio Merino emails to share the results of last week's court ruling on a lawsuit filed against him by the Franco Foundation over artwork it felt disparaged the late dictator: "We have won! But the Franco Foundation is going to appeal ... and they are also going to sue me for the punching Franco work," a reference to a sculpture he made of a punching bag shaped like El Generalissimo's head. Digital Journal has more. • Artist Florentijn Hofman's outrage over a Chinese knockoff of his giant inflatable rubber duckie is "a curious reaction," writes Hyperallergic's Alicia Eler, "considering that Hofman himself created a work of pop art which is, in and of itself, already a copy of a copy of a copy, ad infinitum." James Dolence, Bryce Wilner, Zach Collins, Ficciones Typografika 019-021, installed 07.04.13. 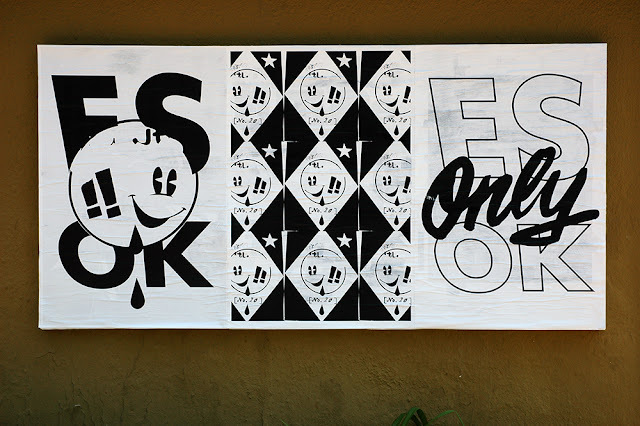 Graphic designer and design blogger Erik Brandt's work has been celebrated around the world. A design professor at the Minneapolis College of Art & Design and a member of the prestigious AGI (Alliance Graphique Internationale), his work has been featured in publications from Maurizio Cattelan's Charley (Greece) and CRACK Magazine (UK) to designboom (US) and IDPURE (Switzerland), and his client work has been just as diverse, including, but not limited to, work for artists, videographers, and festivals. Given the international nature of his design practice (and residences: he's lived in Malawi, Cameroon, Japan, Germany, and Egypt, to name a few), his latest project stands out for an opposite characteristic: its intensely local nature. He's curating an ongoing poster show in his back alley in Minneapolis' Powderhorn Park neighborhood. 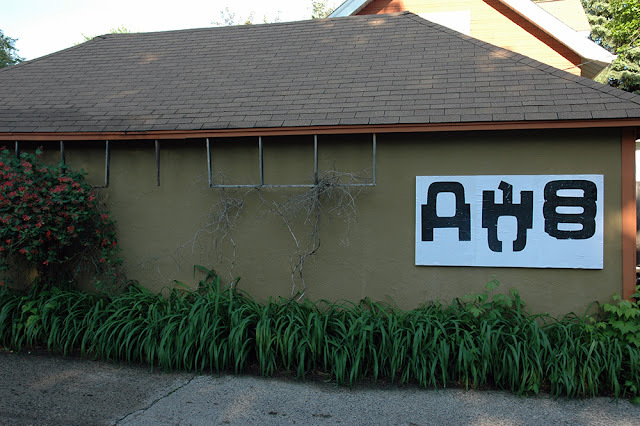 But in typical Brandt fashion, Ficciones Typografika offers a global lens: He's invited artists from around the world to contribute work to the 24" x 36" space on the side of his garage. A neighbor and friend, he agreed to share some of the thinking behind the project. 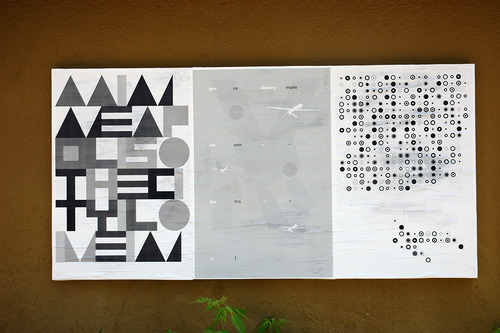 Erik Brandt, Ficciones Typografika 001-003, installed 06.16.13. The audience for artwork on the side of a garage in South Minneapolis is limited. What prompted you to do this, and do you also consider the online life of the project in addition to that in-person audience of neighborhood visitors? This may sound funny, but I really believe in the intelligence and imagination of people. The poster was made for people, to be viewed at a human scale, intimately and also from a distance. It's a medium entirely devoted to life as a human, however distant that concept has become in our world. I used to do much more of this type of public projection in grad school, and this specific idea has been circulating in my head for some time, but it found momentum only recently. 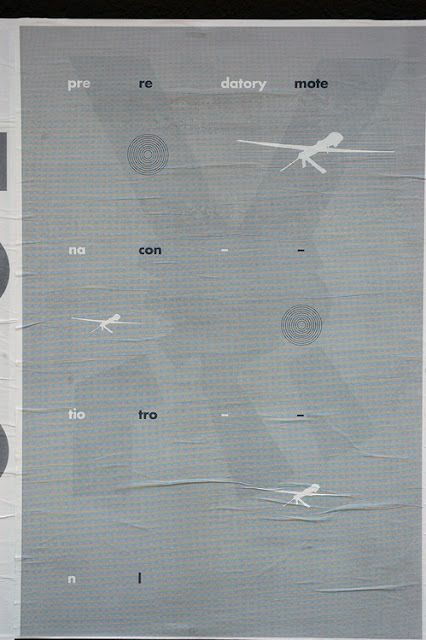 I had been invited to take part in round four of a similar project in Manchester, UK, called No Fly Posters. 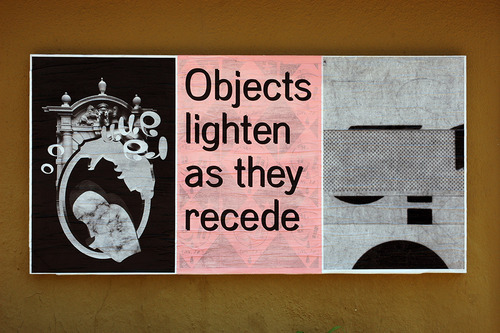 The idea there was to use abandoned buildings as a ground for posters devoted to that theme -- the founder, Jon Bland, started it as a response to a property owner's rejection of some early fun with the space, then started inviting designers to create work that poked fun at his admonition, "No Fly Posters." I just decided that I wanted a medium that I could exploit at will and as often as I wanted, but also knew immediately that I would want to invite artists, poets, and designers from all over the world to join in. The online life of the project both documents and extends the project's reach, and it is especially satisfying to share images of wrinkled posters as opposed to digital versions. Once I have enough submissions, which will be sooner than later, thankfully, I'm also planning on printing a newspaper version of the posters at scale. I'm really looking forward to that; that medium will preserve the transparency, and each poster will interact with each other in a new way. The site for the works and the ephemeral nature of the medium suggest an affinity for street art or graffiti, but the subject matter and style aren't typical of those movements: abstract posters, experimental design. Do you make a connection to such street-based art? Or is there another medium you're referencing? I've been surprised by the conversations this has started with both neighbors and people stopping by. Most seem to feel it is art of some kind, and that is just fine. I can completely relate to street artists and hope this might be a way-station for that kind of activity. It's also a defense-mechanism of sorts: my garage has been tagged a few times, so if it happens again, it will only complement the work on display at the time. James Gladman, Travis Stearns, Huiqian Wu, Ficciones Typografika 013-015, installed 06.27.13. But, yes, I really want to advocate for experimental design and non-specific explorations. A highly-regarded friend of mine recently asked why she should engage with the project. I said that if it felt like design for design's sake, so be it! The Be-Bop artists literally turned their backs on the audience, playing only for themselves, discovering new directions. I'd like to think this offers a similar potential, and I don't mean that to sound arrogant or pretentious. The irony is that it is public, after all, however limited. Indeed, the Internet life of the project will surely reach more eyes. I imagine it both as a place for experiment and projection, and I haven't defined content for anyone I've invited. Tell me about the title. Of course, Typografika is the name of your studio, and "ficciones" is Spanish, hearkening Borges' famed anthology? I've been using that term for many years with regard to both my own work as well as some advanced design seminars I've taught both here and abroad. It is entirely inspired by Borges, though "typografika" was actually a term to describe Czech typographic unions some time ago. My early studio name was ¡ü16.øäk! I started using Typografika around 2000 because it seemed simpler, though I still like the conglomerate nature of the early moniker. It references the languages I grew up speaking, and their identities. 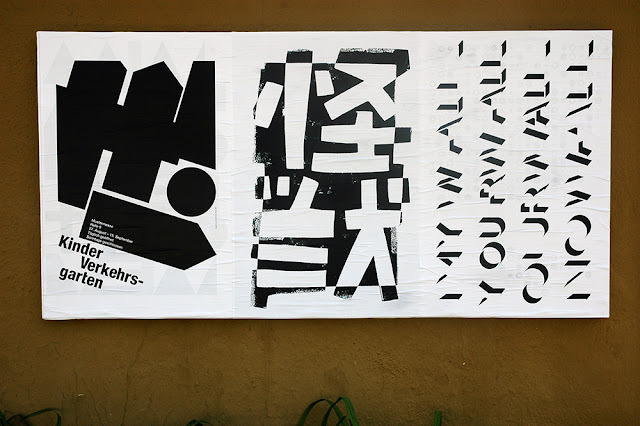 Hans-Ulrich Allemann, Cyrus Highsmith, Götz Gramlich, Ficciones Typografika 010-012, installed 06.24.13. You're featuring international designers in a hyperlocal setting. In that way, the project seems like a gift to Powderhorn, from you and from the contributing designers. I'm glad it comes across that way, it really is a hope of mine that people will enjoy it. So much of our activities are online and revolve around "hearts" and "likes." These get to be rained on and seen by chance, or on purpose. It might be hard to get them up in winter, but I am going to experiment with some heated wheat paste then. To what degree are the works site specific? I see one, Götz Gramlich's "My wall, your wall, our wall, no wall," which seems to be. Will there be others? It's entirely up to the individual. I have encouraged people to work with their own native languages, so I hope Götz will submit a new one in German. I really want to share the vibrancy of language in all of it's forms. There will be submissions from Thailand, Iran, China, and beyond, I hope. Erik Brandt, Ficciones Typografika 007-009, installed on 06.19.13. 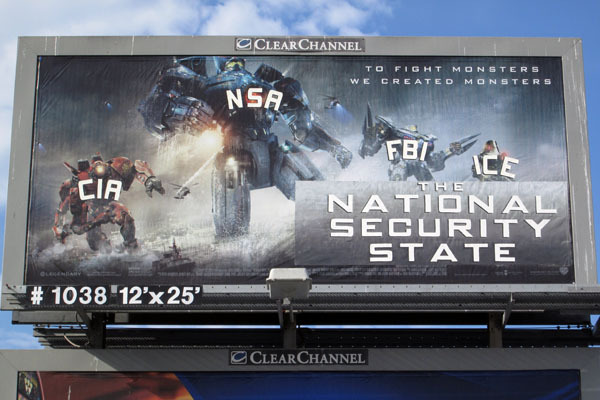 Your predator drone "remote control" piece definitely has some currency as more artists take on the topic in their work. Is there a political message in the siting of the piece -- your alley -- in the way that James Bridle's large-scale Drone Shadows brings drones down from the sky and reminds what few of us can see close up: surveillance or weapons-enabled aircrafts remote controlled by unseen government actors? That poster was reworked from an earlier version I submitted to Mut zur Wut (Courage to Anger), the Heidelberg, Germany poster competition founded by my friend Götz. I like this version better, it's more direct in a sense, and the typographic experiment is subtle yet pointed. His competition invites people to take on subjects that "anger" them, and this one is related to the inaugural event, where I used type found in Minneapolis to determine the message that tried to capture early disillusionment with the promise of Obama. The recent revelations of NSA surveillance of citizens worldwide has only compacted this feeling. We came so far, but at what cost? It is deeply disturbing to me. Travis Stearns and I share a similar viewpoint, and his recent submission echoes that same sense of foreboding. I love the DIY nature of this. You're an accomplished designer/artist with lots of client work and design accolades. What does this kind of project do for your process? Does it fill a need or scratch an itch that client work might not? Well, thank you for that compliment, sincerely. It fills a need to communicate and experiment, and it's especially satisfying to include others, both students and professionals, artists, poets, and designers. It's so simple, and so joyful. 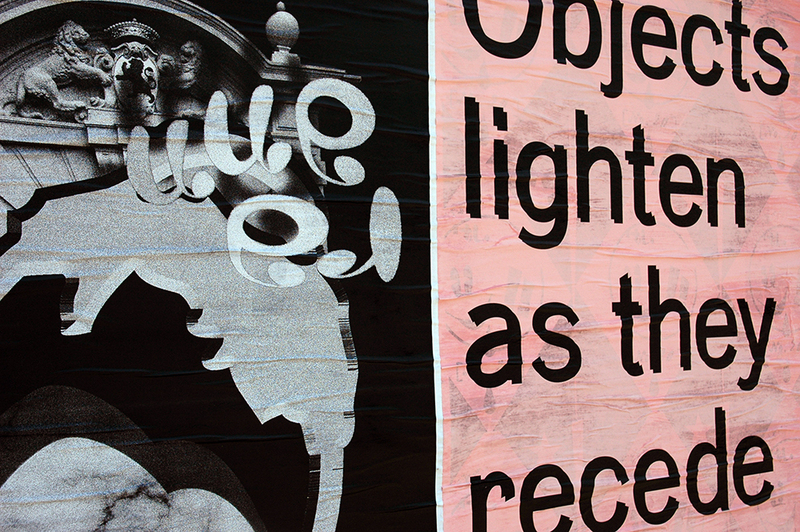 Armin Hoffman remarked once that posters expose the soul of a city. I am hoping to share the souls of the world. 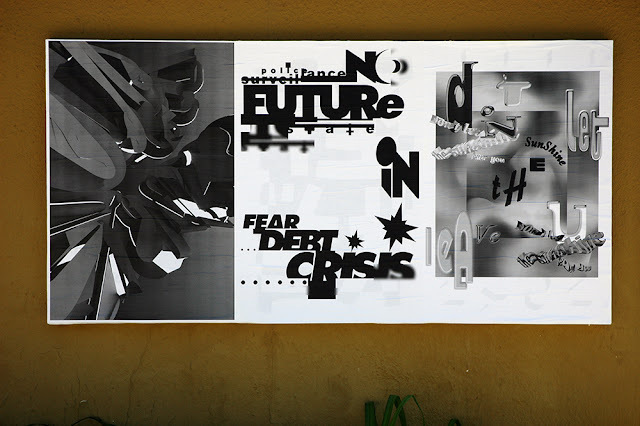 Ben Proell, Ficciones Typografika 16-18, installed 06.28.13. 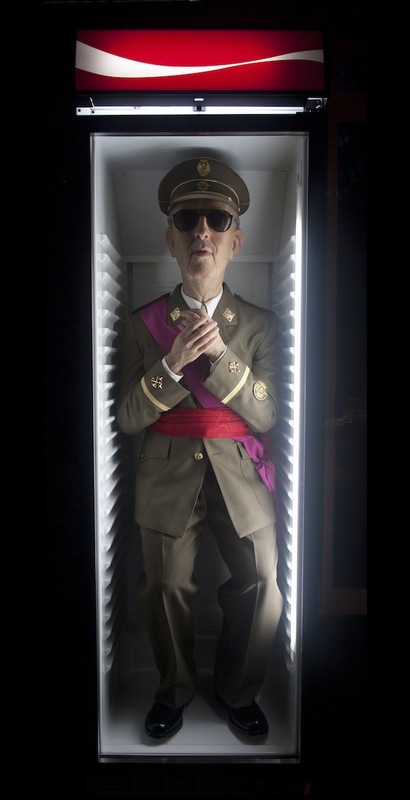 Eugenio Merino's response to a lawsuit by the Francisco Franco National Foundation (FNFF), seeking €18,000 in damages for his sculpture of the late dictator preserved in a Coca-Cola refrigerator? A group art show--mounted just days before the trial is set to begin--of anti-fascist art, including the debut of Merino's own depiction of a punching bag shaped like El Generalísimo's head. On July 11, 2013, Merino will appear in civil court to discuss his presentation of the artwork Always Franco at the ARCO international art fair in 2011. FFNF--a group dedicated to "la difusión de la memoria y obra de Francisco Franco" ("dissemeninating the memory and work" of Franco)--is suing the artist and the fair for a work FNFF's vice president, Jaime Alonso, characterizes as a "serious offence against the former head of state." The work, he told Spanishi media, "generates hate and confrontation" and turns the 40-year military ruler into "a caricature, a puppet." The July 11 proceeding is the third and final hearing on the case. But before it begins, Merino will show his never-before-exhibited Punching Franco as part of the three-day Jornados Contra Franco, July 5–7, 2013, mounted by Artistas Antifascistas in Madrid. More than two dozen artists--including Alejandro Jodorowsky, Santiago Sierra, and Tania Bruguera--will exhibit works about censorship and fascism. For Merino, controversy about his art is nothing new. Known for an on-the-nose approach to hot-button issues from religion to politics to consumerism and poverty through satirical sculptures, his works often raise hackles. 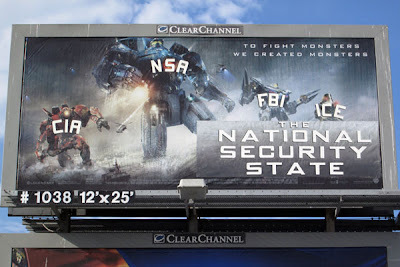 His hyperrealistic style has rendered a disco-dancing Osama, a machine gun–toting Dalai Lama, a George W. Bush punching bag, and a homeless man asleep under an Ikea box. And he's had his share of ARCO outrages prior to this one: In 2009, he showed a sculpture depicting artist Damien Hirst, entitled 4 the Love of Go(l)d. Riffing on the blue chip artist's For the Love of God, a £50m diamond-encrusted human skull, Merino sculpted Hirst's figure--presented in the British artist's trademark glass case--moments after his imagined suicide, a pistol still held to his bloody temple. "I thought that, given that he thinks so much about money, his next work could be that he shot himself. Like that the value of his work would increase dramatically," Merino said at the time. Another piece, Stairway to Heaven, stirred controversy at ARCO 2010. A totem pole of of sorts, it stacked a praying Muslim man, a Catholic priest, and a Rabbi, but with one twist: each held the holy book one of the other figure's faith. While reportedly purchased by a Jewish art collector in Belgium, the work was condemned by the Israeli Embassy in Madrid as "offensive to Judaism," although Merino says he was exploring "the coexistence of the three religions, joint in a common effort to reach God, in a literally [sic] way." But despite the furor over his work, "Franco in the fridge," as he calls it, is the first time he's ever been sued for his art. "In Spain, anything is possible, even the existence of a foundation that supports a dictator," Merino said via email this week. "Yes, I was surprised because it seemed to be something stupid to make all of this fuss over an art work. Now I know that art may be really effective." Always Franco echoes the soft drink giant's ad campaign slogan "Always Coca-Cola," putting Franco in a refrigeration device that will keep the uniformed caudillo fresh. "I thought it reflected well the idea of the permanence of Franco even after his death -- a kind of immortality," says Merino, who was born in 1975, a few months before the 40-year dictator's passing. He notes that the fascist leader and his ideas continue to make headlines today. He lays out the issues the lawsuit represents: "First, there is a Franco Foundation that receives public subsidy. Second, they have the power to sue anyone who talks about the dictator. Third, art is global, so the world may notice that the dictatorship is still a big issue here, although our politicians look the other way. And fourth, they have power and they act in politics, arts, and society." Plus, he notes, "the actual government has never condemned the dictatorship in public." [I]t is striking that the foundation that protects the “legacy” of a dictator -- who harshly persecuted the exercise of liberties and was directly responsible for the suffering of hundreds of thousands of exiles and victims of reprisa -- is attempting to restrict freedom of speech, especially when the very existence of this organization and its systematic justification of the fascist legacy should shameful in a society that claims to defend liberties. Secondly, it seems inappropriate for a foundation of these characteristics to set itself up as judge of artistic expression, when the only aesthetic contribution of the Regime they vindicate was the destruction of all critical culture, accompanied by the cry of “Death to treacherous intellectuality." This situation makes us wonder if these lamentable events can only happen in a country like Spain, incapable of evaluating with distance the disastrous consequences of the military dictatorship that controlled the country for 40 years. It is hard to imagine an Adolf Hitler Foundation in Germany persecuting the work of Gerhard Richter, Maurizzio Cattelan and so many others for criticizing Nazism. Therefore, we wish to express our firm support of Eugenio Merino, our desire to defend freedom of expression – in the visual arts but more importantly in any area of social life- against the increasing assaults by totalitarian attitudes, while clearly manifesting our profound rejection to the heirs of the dictatorial regime, who today represent the most abject values of Spain’s recent history. Given the silence of the Spanish media stablishment, determined to maintain the amnesic silence with which the transition restricted any attempt at critical analysis of the Francoist past, we wish to denounce this perverse maneuver by the heirs of the dictatorship while urging every member of society to defend and expand our rights and freedoms.